SMDM appreciates contributions at all levels. Your generous donation will be used directly towards the fund of your choice. $10,525 raised as of December 31, 2018. Your gift will be used to support the programs and services SMDM undertakes to further our goals of promoting medical decision making principles to new audiences and throughout the world. Programs include training for researchers, clinicians and decision makers, mentoring and networking opportunities for our members and outreach on continents seeking knowledge of and training in medical decision making principles. $6,675 raised as of December 31, 2018. The Lee B. Lusted Student Prize Fund recognizes and supports young decision makers for outstanding presentations of research at an SMDM meeting. In 2018, your gifts supported 10 winners at the 40th Annual Meeting in Montreal. Learn more about early career awards. $1,475 raised as of December 31, 2018. 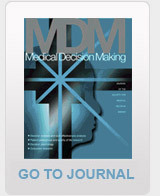 The John M. Eisenberg Award for Practical Application of Medical Decision Making Research recognizes an individual or organization that has demonstrated sustained leadership in translating medical decision making research into practice, and that has taken exceptional steps to communicate the principles and/or substantive findings of medical decision making research to policy makers, to clinical decision makers, and to the general public. $1,050 raised as of December 31, 2018. In January 2016, SMDM held its second Asia-Pacific Conference in Shatin, New Territories, Hong Kong. As a result of this conference, SMDM was invited to provide training to three other groups, one each in Tokyo, Malaysia and Singapore. Our trainings are part of a long-term commitment to building stronger connections with medical decision making communities outside of North America and Europe. Your gift to the Asia-Pacific Outreach Fund will be used to support continued outreach to and training in the Asia-Pacific region. A growing number of generous individuals are choosing to support their favorite causes by making a gift to charity in their wills and trusts. You can make a gift to the Society for Medical Decision Making of a set dollar amount, a percentage of your estate, or what is left after taking care of your loved ones. Bequests to the Society are entirely free from federal estate tax and there is no limit on the amount you can leave to the Society or any other charitable organization through your estate. the sum of $____ (or "___%" or "the rest, residue and remainder of my estate") to further the field of medical decision making (or "to support the Lee B. Lusted Student Prize" or "to support the annual meeting"). Thank you for considering creating a legacy through your support for the Society for Medical Decision Making!